Blogging is A LOT of work and content creating is the bulk of it. In theory, it shouldn’t be. Of course blog content is important – but what about marketing, building your tribe, and making sales? With the sheer volume of content we need to create today, I always feel like I’m behind. I look at all of the things I want to get done and think – how is ONE person supposed to do all of this? But let me tell you a secret – it is entirely possible to create a GOOD blog post in under an hour. Think about it this way – if you could write even 50 words a minute (which isn’t a fast typing speed, it’s about average), you could still get 2500 words written in 50 minutes and have 10 minutes left for editing. So why CAN’T we manage to get more written in the time that we set out? Distraction, overthinking, re-writing, perfectionism, and poor planning. It’s our minds that get in the way. It’s not the actual writing, it’s everything else involved in the process. And here’s the good news: it’s 100% overcome-able (I know that’s not a word, but let’s just roll with it). You CAN change these things and train yourself to do less of the bad (like reading and re-reading what you’ve written) and more of the good (like writing the RIGHT words, the FIRST time). Today I’m going to walk you through my step-by-step process on how I do this. It’s not hard – it only takes a bit of prep and the right kind of blog post. If you want more productivity tips, grab the productivity guide in the Free Library. 1. Write about a quick win. 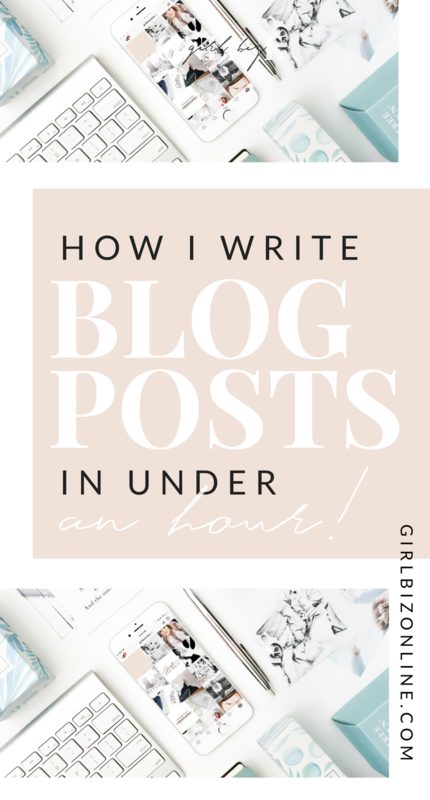 When you need an answer to a question – whether it’s about a new super food, how to style a shoe, or a blogging tip – you’re often NOT looking for a massive, indepth blog post. You might not want a bunch of information, and you might actually be overwhelmed if a post gives you too much to think about. You’re probably looking for a CLEAR answer to ONE question. And a really good blog post can give you this. That’s what I try to give to my audience when I write these shorter posts. Scaling back and thinking about what people are actually looking for is a great way to write short content that is still impactful. 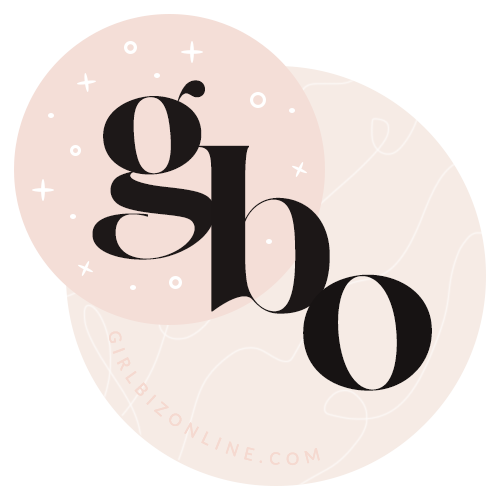 I always get asked about the basics of starting a blog and monetizing it. This would be a HUGE in-depth post so I’ll need to break it down into smaller, more manageable tips. So what do I think someone who is starting a blog is looking for? I use Google Trends to give me ideas about what kind of content people are looking for. I have a whole post on that here. Here is an example of some content ideas I got when I searched Google Trends for ‘blogging’. What is a blogging platform and which one should you choose? Is Wix Good for Blogging? Don’t get me wrong, there is definitely a time and place for longer posts – just not all of the time. Working on these quick-win posts helps me get a lot more content written and I think it works better for my audience too. pro-tip: the more of these shorter posts you write, the more content you have ready to create a full guide (or even a paid course later). Think of something paid you might want to create and start doing the work now – through blog posts that you can repurpose down the road! Step 2 is making sure that I’m able to make quick, clear decisions and that I’m going to stick with my commitment of getting this thing done NOW. How? By avoiding decision fatigue. You might not even notice it happening to you, but it’s a real problem. Think of your decision making strength like a health meter in a video game. The more you use it, the more the bar depletes. By the end of the day, you are decision-drained, and it’s much more difficult to make ANY choices. You’re likely to take the path of least resistance – like giving up, leaving the rest of the post for later, or “taking a break” that drags your hour long post writing session into 4 hours. Not good. But you can restore this meter with glucose – or sugar. I ALWAYS sit down to write after I’ve had a meal (preferably breakfast, because it’s morning and I haven’t had to make many decisions or tests of willpower this early in the day). If I can’t do this, I’ll have a quick hit of glucose – like an apple. Or, let’s just be honest here, I put my finger in the jar of honey. That I’m more likely to make better, faster decisions when I’m writing (which will improve the quality and lessen the amount of editing). I’m also more likely to stick with it. I’m not going to feel as drained and want to give up. I’m able to use the full strength of my will power and motivation to keep going. Motivation and decision fatigue is half of the battle. Try this and you will see better, faster results. 3. Choosing the Right Music. Step 3 is to put on my music. Studies have shown that music with lyrics or music that is unfamiliar can be counter productive to any creative work. Both these types of music use too much of your attention, even if you don’t consciously recognize it. Part of your mind is focusing on the words or the changes happening in this new song. And to be your most productive, you want ​all ​of your energy on the task at hand. I can’t work without music so the best recommendation is to listen to ambient music (no lyrics, relaxing tones) that is familiar. So make a playlist and stick to it – you’ll notice a HUGE difference in your concentration and focus. So I’ve just eaten (or had a bit of sugar) and I’m feeling fresh. I have my music on and my content planned. The next step is to open up my blog post page and enter Wordpress’s Distraction free writing mode. This option lets you clear the screen to get rid of all of the pesky distractions along the side – you can JUST focus on the text blog to do your writing in. This option is automatically enabled with WordPress so all you have to do is hit the button and distractions are gone – it’s just you and the writing that you need to get done. WordPress’s version doesn’t have any advanced customization however, and it does still leave some distracting areas on-screen. If you need to get ​even more​ focused, try the plugin Just Writing. It allows you to customize your Distraction-Free mode and keep only the buttons you need. And let me just say – I am so thankful for WordPress. As a blogger, it lets you do things you never even thought about needing. If you don’t use WordPress for your blogging, you can use external tools like Calmly Writer and then just copy and paste your content into your editor when you’re done. 5. Set your Pomodoro timer. 1. It’s a cute concept. You plant a tree in your garden and it grows during your Pomodoro cycle. When the timer is up, if you’ve made it through and stayed focus, the tree is grown! It turns productivity into a game! Plus the more successful cycles you complete, the more money you have in the game to buy other types of trees and plants to make your garden amazing! 2. The app blocks you from using your phone! If you touch your phone during the Pomodoro cycle, your tree will die – and a dead tree will go into your garden. Every time you look at it, you’ll know you failed that cycle. It’s really addicting to play this like a game. Once the timer is up, you can take a 5 minute break and get started again. If you can get a blog post done in 2 Pomodoro cycles, it would be an hour. I find that this strategy REALLY works for me. 6. Don’t doubt – just write. Once I’m all set up and hit START on my Pomodoro timer, it’s time to ​just write​. I use a strategy called ‘brain dumping’ or ‘info dumping’ or ‘stream of consciousness’ – whatever you want to call it. It basically means that I write without going back to edit, leaving to check facts or add images – I get the words down on the page and leave the rest until the end. Why? It means I don’t waste time coming in and out of tasks. It is practice at being more intentional with my words and getting better at communicating my thoughts as I have them – no editing necessary. Seriously – the more I do this, the less I find that I need to edit at the end. I’m just getting better and better at putting the RIGHT words down on the page and not needing to go through and correct, edit, or re-phrase. And THIS, I think, is the key to getting blog posts done quickly. If you can write for 25 minutes and you don’t need to clean it up or change it afterwards, the amount of content you could put out would be RIDICULOUS. So I highly recommend that you try this – write your post as it comes into your head. Don’t overthink it or leave your writing for any reason. Get the words out and worry about the rest later. The more you practice this, the better you’ll get at getting it right ​the very first time​. 1. Focus on a quick win. 2. Write after a meal or hit of sugar. 3. Pick ambient, lyric-free music. 5. Set your Pomodoro timer to eliminate off-screen distractions. 6. Write now, edit later. I would love to hear your results if you try this – I really think it will work for you too. If you have any productivity hacks, please share them in the comments! 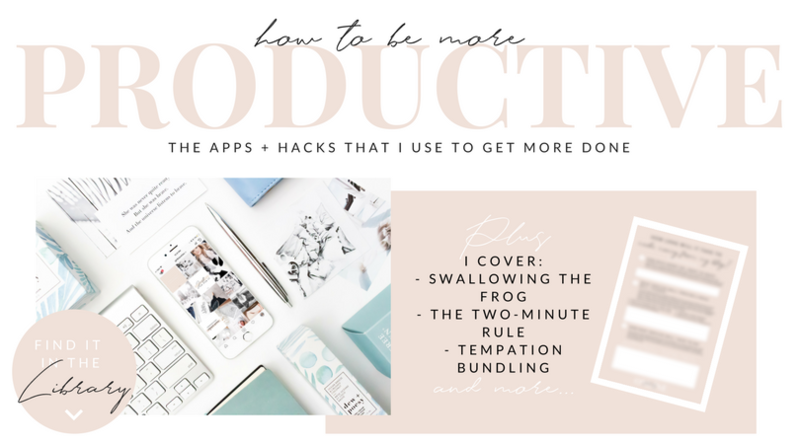 And don’t forget to grab the Ultimate Productivity Guide – I share my BEST productivity hacks and apps (for both phone and computer) that help me get A LOT more done, faster.